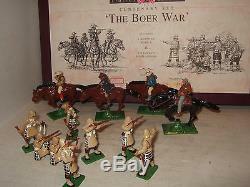 Britains 00259 Rare Centenary set, The Boer War, inc 4 Mounted Boers & 8 Cameron Highlanders. Britains Multi Piece Full Box Set, celebrating Tradition Quality and detail. This is a listing for this Rare Britains No 00259 Centenary Set, The Boer War, including 4 Mounted Boers & 8 Cameron Highlanders all in action poses. Its a complete set , Limited to only 1500, and comes with Inner Box and Tray, Deep Foam padding, Britains paperwork inc leaflet on the Boer War and the Highlanders part in it, plus original mailer outer. These figures are in New condition, never been out of box apart from for my photos been out of the box apart from for my photos, though it was noticed one figure is loose in the saddle and may need a dot of glue when you receive (easy fix). The Set even comes with its original Brown mailer outer Box. Check it out, my same condition set, will be much less. Are metal, all meticuously detailed , and hand painted, and detail and quality is typical of Britains in 1:32 Scale (54mm). I have other Soldier sets on sale, including Britains Sherwood Foresters sets 8814, 8815, 8816, and 8817, and other ones to be listed soon, also single unit Scottish pipers and other Scottish Bandsmen figures and bandsmen either already up or going up soon, including Bugler, Big Drum, Pipe major etc. I have more items like this, or similar, plus lots of other great products either already up, or coming soon. I will always leave Feedback once Feedback has been left for me, but please give it plenty of time as i do mine once weekly. My auctions are always nearly for 10 days to allow for this. Last minute questions might not get answered. I always get certificate of posting to prove proof of posting. I post items daily from the UK. I do everything there is relating to these items. Usually its approx 1 to 3 days for 1st class post, and 2-5 days for 2nd class post, but all post can take up to a week, or more at peak times like Christmas. The best way round this is, if you can, is to combine with other items. This is a normal small charge applied by most sellers, and in our case its lower than most, as we do realise that with the Royal Mails ever increasing their postal costs, that its a concern for all buyers. One thing to realise is that recent Postal changes within the UK, means that. All items up to 750 Gramms. Now cost exactly the same rate. We hope you've found what you need. Items will be posted as securely as possible, and marked clearly. Check out my other items. The item "Britains 00259 Rare, The Boer War, inc 4 Mounted Boers & 8 Cameron Highlanders" is in sale since Friday, April 28, 2017. This item is in the category "Toys & Games\Toy Soldiers\Britains". The seller is "uktanker" and is located in Thatcham, Berkshire. This item can be shipped to North, South, or Latin America, all countries in Europe, all countries in continental Asia, Australia.